Acer is the Latin name for Maple. platanoides translates as "like Plane Tree", referring to the similiarity of its leaves to the European Plane Tree (Platanus x acerifolia). Norway Maple is a shade tree that is an alternative among the Maples for more rapid establishment in some urban areas than the more popular Sugar Maple (Acer saccharum) or Red Maple (Acer rubrum), and is also noted for its purple-foliaged cultivars. While Norway Maple does not establish as rapidly as Silver Maple (Acer saccharinum), the latter has weak wood that is prone to storm damage, and has a lack of branching symmetry that most other Maples have. 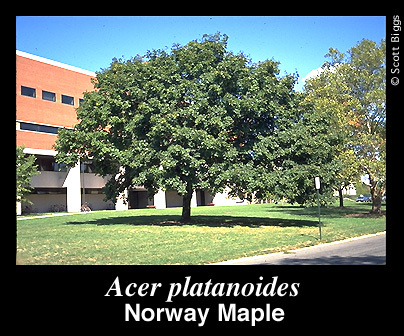 Acer platanoides is a rounded, dense shade tree at maturity that, along with European Beech (Fagus sylvatica), is one of two options for large, long-lived purple-foliaged shade trees, and is the faster growing and more urban tolerant of the two.